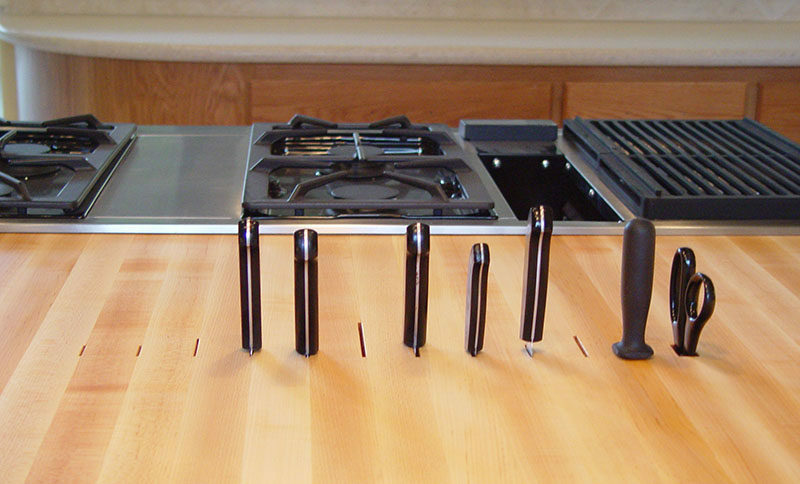 Knife blocks that sit on the counter can be a nuisance. They take up valuable counter space, they slide around, and they don’t always look good. 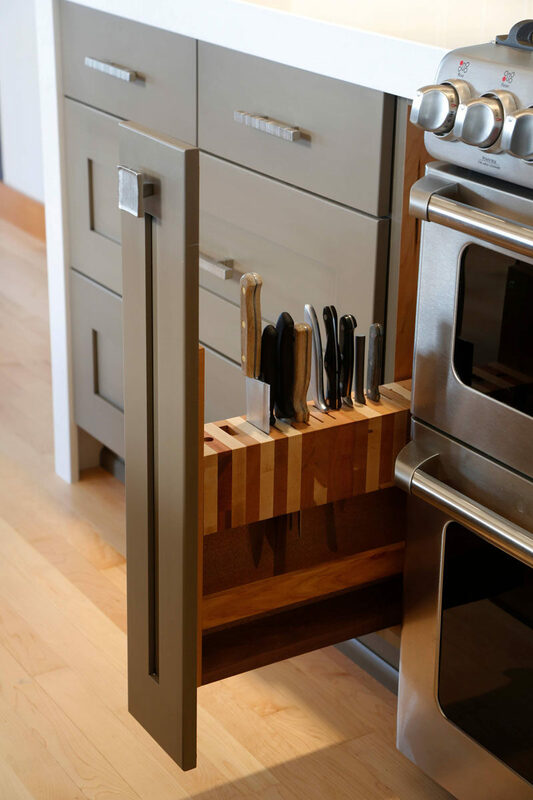 Built-in knife blocks eliminate all of those issues and keep your knives within reach, but also out of the way. They come in a variety of styles including small slits in the countertop, defined wood blocks, and hidden shelves that pop out of the counter. 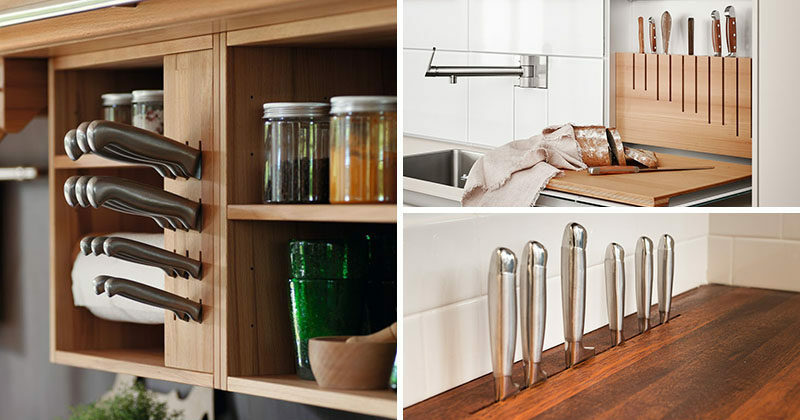 Let’s take a look at a few different ways you can include a built in knife block in your kitchen design. 1. 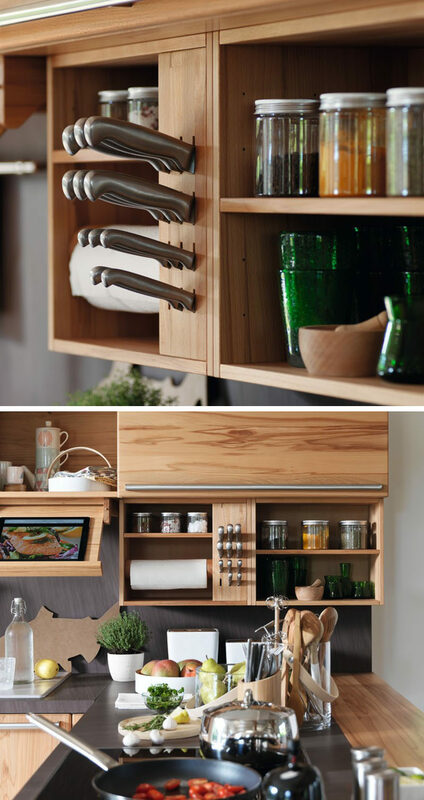 This knife block is built into the cabinetry instead of the countertops to save valuable space and keep the knives out of the reach of children. Inspiration from the Rondo kitchen designed by Team 7. 2. Slits in this butcher block countertop keep the knives in the most convenient spot, making food prep a breeze. Designed by Hill Farm Furniture. Photography by Chris Ashwin. 3. 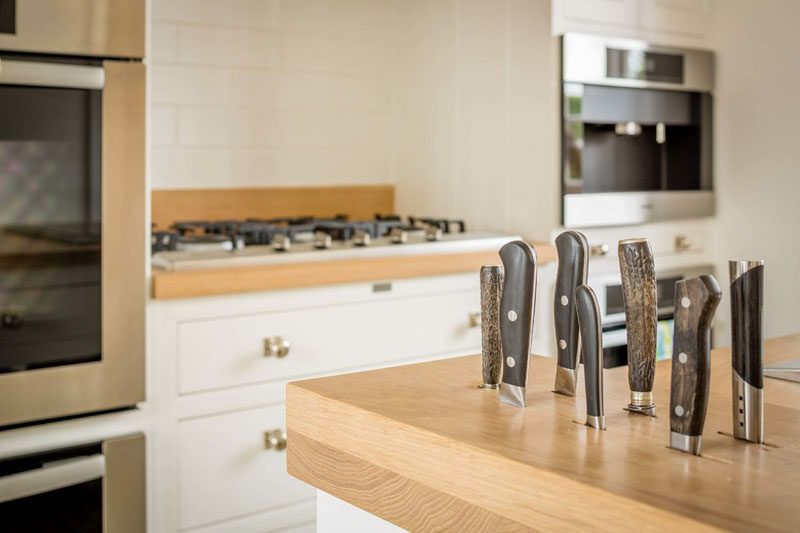 This custom knife block has been built into a small drawer to make use of the small space between the stove and the other drawers and to keep the knives off the counter, making more room for cooking. Kitchen designed by Signature Design & Cabinetry LLC. Photography by Brian DalBalcon Photography. 4. A single slit in the back of this wood countertop provides the perfect spot for storing knives and doesn’t restrict the sizes of the knives that can fit in it. Kitchen designed by Rick & Cindy Black Architects. Built by DeVos Custom Woodworking. 5. This built-in knife block curves with the countertop and is in the perfect location to easily grab a knife when you’re cutting at the attached butcher block counter. Inspiration from a kitchen designed by Johnny Grey Studios. 6. This knife block is built into the wall to make it easy to grab a knife when you need it and keeps the knives off the counter to save precious prep space. 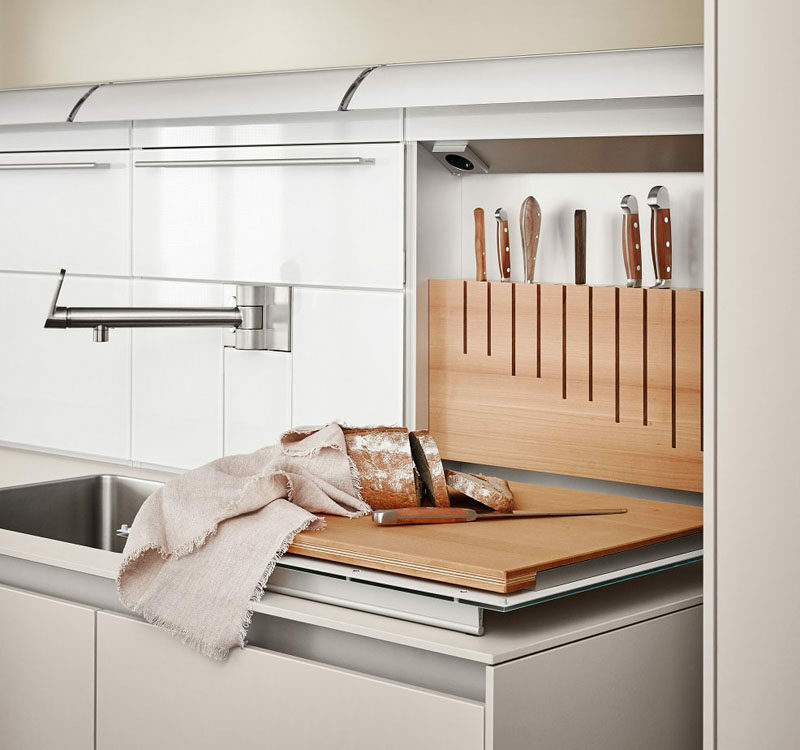 Inspiration from a kitchen designed by Bulthaup. 7. 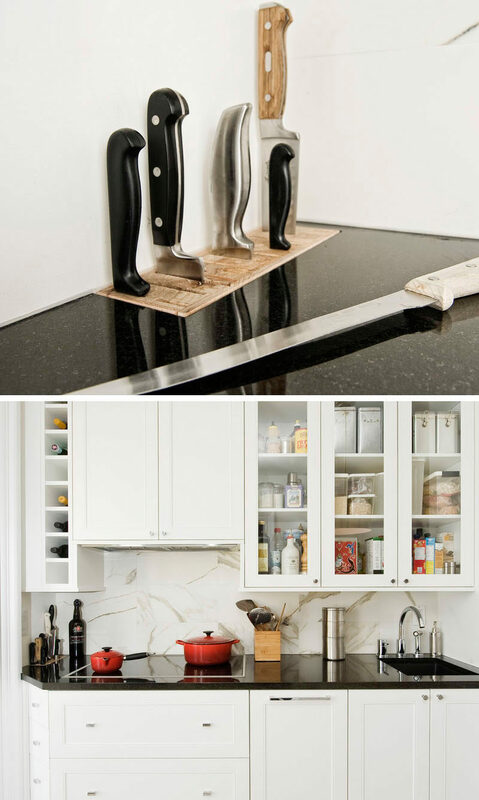 This knife block tucks right into the countertop and pops up when you need it, making it a super safe option and one of the best ways to maximize countertop space. Pop up kitchen knife block from S-Box Plus. 8. 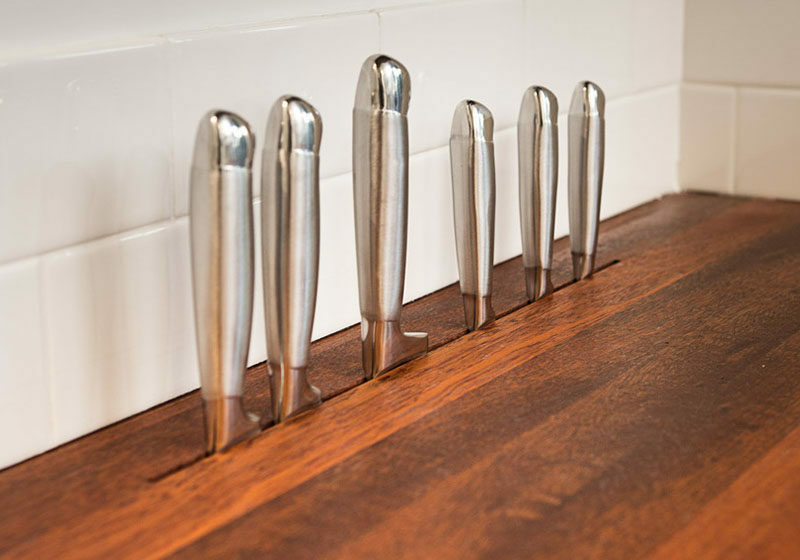 Custom slits have been made in this countertop to accommodate various knives, a sharpener, and the scissors, keeping all cutting utensils within reach at all times. 9. This wood knife block sits in the corner of this small kitchen countertop and contrasts the dark countertop material. Kitchen designed by Laure Guillelmi. Built by by Gepetto. Photography by Yannick Grandmont.